Our Premier 6.5 Foot Delta is an excellent family kite. 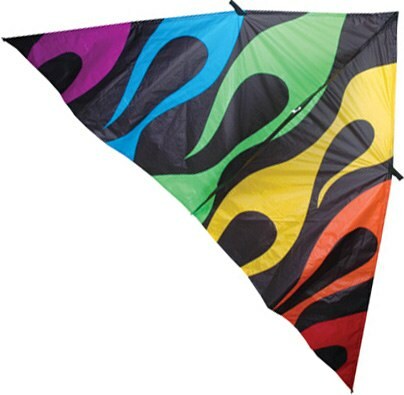 We love it because it flies in the widest wind range of any kite in its price class. Solid design, excellent craftsmanship, and premium materials combine to make this among the best kites you can buy. This 6.5' delta is a delta kite done right, with quality and durability that are top flight. A kite that will last for years and years and will never let you down. From light winds to strong, the Premier 6.5’ Delta Kite will get you flying when others kitefliers remain stranded on the beach. Easy to fly even in light winds, this is one delta kite that is eager to please. Our friend Cindy in Texas says she has been flying her Delta 6.5' for 10 years! And just like her, you can get your family air-born the easy way with one of our favorite family kites. Don't forget to add one or more of our amazing Transition Tails for a sky show that will blow your friends and family away! Though this Delta kite comes with three short (about 5' long) tails, there is nothing quite like adding two or three Rainbow Transition Tails to this package. Using the simple clip that comes with all our Trans Tails, attache one tail on each of the 6.5' Deltas' three tail attachment points, and your are ready to roll. Or if you are on a budget, consider adding just add one Transition Tail to the center tail attachment point and use the short stock tails on the outer two points. We promise you will be surprised how much excitement the fancier and longer tail adds to your kiteflying fun. A word of warning though, our Transition Tails are extremely addictive... it is very hard to stop at just one! You can't go wrong with our Premier 6.5' Delta Kite for family kite flying fun. After 25 years in the kite business we think the EO6 is one of the finest production kites we have ever seen. As kite designers ourselves, we know great work when we see it, and our Australian friend Phil McConnachie has out done himself. Though the EO6 looks fantastically complex, it is one of the easiest kites you will ever fly. Add the fact that, in low winds, it can become your tumbling gem in the sky is simply brilliant. Equally at home high in the sky, hanging in your living room, in a modern art gallery, the Prism's EO6 is the perfect blend of form and function. Though Prism makes this kite in three sizes, the EO6's ease of flight and wider wind range make it easily our top pick. It is also the least expensive. The EO6'S smaller size makes it transport to your kite field a breeze. Playful tumbling moves and crazy yoyos are all within your grasp with this wonderful kite. All in all, the "6" is the best value in the EO line. I bought this for my 2 1/2 year old and 1 1/2 year old to play with at the park. With a light wind, I can laucnh it with my hand no need to play out lots of line, run, or anything just hold it over my head and let go. I have flown it up to the limit of the provided string I think it's about 300 , but it's most fun to fly it lower where the kids can see it better. At really low altitudes it can drop quickly when the wind changes, but you can pull on the string or run to keep it up. If I fly it up to about 80 or more where it's more stable, my 2 1/2 year old can hold it. If I pull it in to about 10 , I can run around the park with it flying just overhead, buzzing the toddlers with the tail. It doesn't handle violent wind and gusts well, but it's not intended for that. It's so easy it might get boring for someone capable of handling multi-string stunt kites, but for any Charlie Brown, this is the right kite. There are other kites that fly easily, but these Easy Flyers are also supposed to have lighter line pull, making it less likely to pull or jerk the string out of a child's hand. Still, for under 5 year olds I do most of the flying. Therefore I'm going to try some helium balloons on the kite string instead. I'm also keen to try a KongMing lantern. Our area is popular for hot air ballooning and maybe when the kids are older we could build an RC balloon. 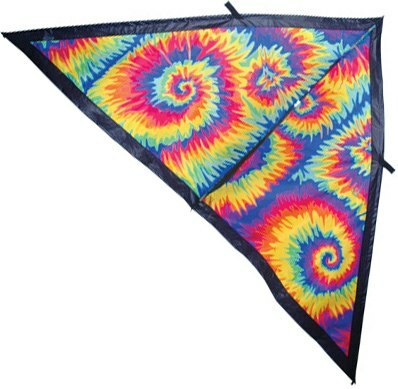 A kite like this can get a lot of things started. Enjoy. Even more fun with extra tails! 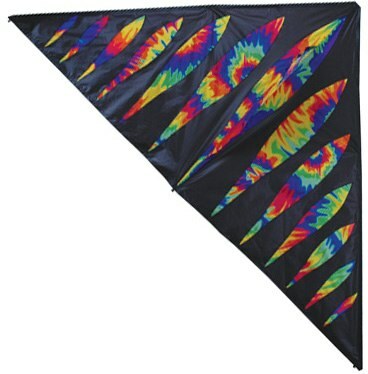 We first tried the Tie Dye model with the stock tails that come with it and though it kite flew great,we kept think about what Tom told us about the rainbow transition tails: "Add a few of thes tails and you really will put on a sky show." We started with just one short tail and now have three. A 50' footer in the middle and two 25's, one on each side. Every time we fly, strangers come up to us and compliment our display. The tails add so much fun we love it. Tom was right about another thing: Be careful because the tails are addictive! We saw one flying last month and the guy had six 50 footers. Now I have tail envy! Click the button below to add the Premier 6.5' X-Delta Kite, Flame to your wish list.